See if you can remember a time that perhaps lasted only a minute, when nothing came to interrupt your peace of mind. Perhaps you were on a beach or walking in a groove of trees, and suddenly you felt safe, whole, and loving, and for that moment all was well and your future was not in doubt. If you can’t remember such a moment, imagine it. Experience how quiet and at ease your mind would become, how expansive you would feel, and how clear and present you would be. Now picture what it would be like to have that moment extend until it became your day. This might give you a hint of what it would be like to be free of the fearful illusions that a brain chronically under stress generates. Without these illusions, there would be no fear, no stress, no doubt, and no need to attack or defend. “Who you are,” states Eckhart Tolle, “is the very sense of being, or presence, that is there when you become conscious of the present moment. You and what we call the present moment are one.” In the quiet of the present moment, the false image of yourself fades. The image of a threatening world fades. The judgments you project onto people and events fade. Your fear of failure fades and what takes its place is the happiness you can experience right here, right now, when you are not afraid of anything. Peace is powerfully positive and yet some people equate it with complacency. To the contrary, inner peace is the mental state that drives the emotional intelligence that predicts success at every level of life. The poet W.B. Yeats said, “We can make our minds so like still water that beings gather about us that they may live for a moment with a clearer, perhaps even with a fiercer life because of our quiet.” Growing up, the person who fit Yeats’ description in my life was my Irish godmother. She was wise with a face that was lit from within and a quality of presence that was kind and calming. Our home was full of the pandemonium that my siblings and I could make, but when Genevieve came to visit we all quieted down and behaved ourselves. We loved being in her presence. Her way of being had a way of inspiring us to want to do something good with our lives. 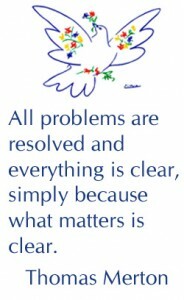 Thomas Merton wrote, “All problems are resolved and everything is clear, simply because what matters is clear.” Which is to say, what matters is the quality of your inner experience as you face the outer world. One way to bring a little more peace to a stressful day is to take an occasional time-out to give peace the chance to change your day. It’s simple and only takes a minute. Here’s how. Let go of what you were thinking or doing, and allow your mind and body to relax. No worries, no problems, no goals, no one to please, nothing to change or fix. Take a slow, deep breath and as you do, let your mind and heart open wide and allow peace to emerge as your experience, all by itself. This entry was posted in Uncategorized on June 8, 2016 by Don Joseph Goewey.